The best events are always memorable. Unfortunately, the worst ones are too. This applies to all types of events, including conferences and other corporate events. For both the host, organizing and promoting the event, and the sponsor, running a booth designed to generate awareness and leads, events provide a unique opportunity to be memorable. You can build on a current campaign, create a theme, or provide guests with an interactive activity, but it all comes down to creating an experience while building your brand. Remember, events, by definition, are meant to be something out of the ordinary. 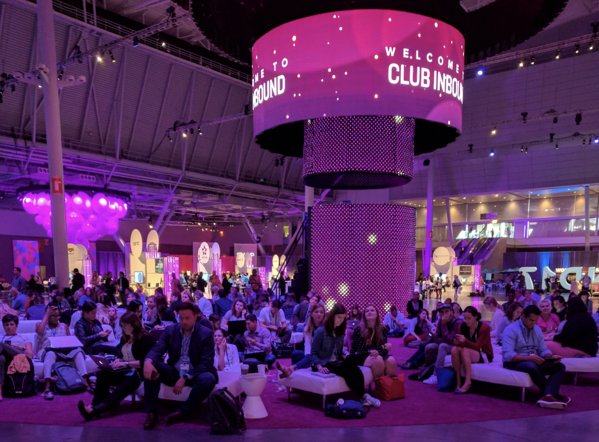 If your sponsor booth looks like it was picked off of a conference assembly line, it’s time to shake out the cobwebs and find a fresh perspective for your event marketing strategy. All of these sections are designed to spark your creativity and (despite the endless hours of work!) get you excited about your event. Take it from Cathy McPhillips, Vice-President of Marketing for the Content Marketing Institute (CMI). 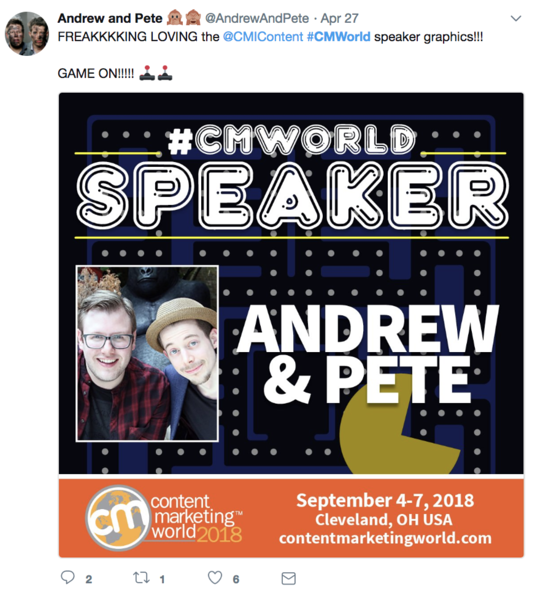 The organization hosts Content Marketing World (CMWorld), one of my favorite events, which hosts 4,000 marketers from over 50 countries. To say she knows a thing or two about event management is an understatement! Let’s take a look at why branding is important to your event’s success. Brands, by nature, exist to be meaningful. They should be unique. Think of some of the biggest brands you know. Whatever comes to mind – Coke, Apple, Nike, McDonald’s – each invokes a certain feeling or emotion. That feeling is designed to be a positive one. As marketers, our goal is for customers to associate those positive emotions with our brand. The same thing applies to events. 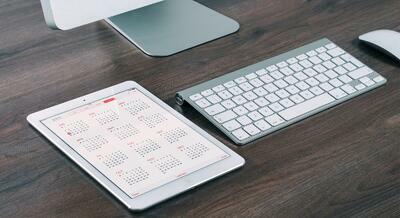 Whether marketing, accounting, or human resources, every industry has plenty of conferences. Event experiences and branding set you apart. What makes people want to attend your conference? How can you ensure they’ll keep coming back year after year? Your event’s experience may tie into your company branding as a whole. I can think of no better example of this than CMWorld, the conference managed by Cathy and a team of 29 at CMI. The company’s logo just so happens to be orange. So the team took orange and ran with it. And, I mean, they REALLY ran with it. The result was, without a doubt, memorable and creates an experience! Don’t believe me? The food, all of it is. Orange. Yes. Orange food at every break. 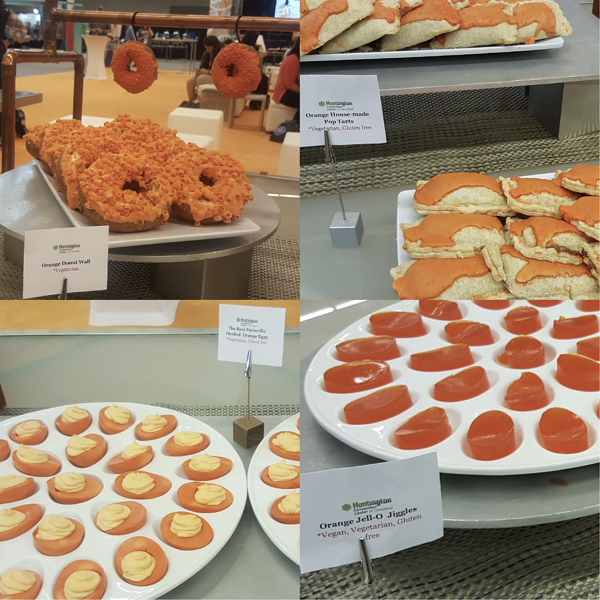 Orange Jell-O, orange donuts, orange Pop Tarts, everything. See? Memorable!! And here’s the proof from my Content Marketing World (CMWorld) experience in 2017. No, your eyes aren’t deceiving you. Those really are orange deviled eggs! And, of course, I have to include the bright orange carpet in the middle of the sponsor hall, courtesy of yours truly (well, my coworkers!) at G2 Crowd. The element of orange makes both the event and CMI itself notable. It also creates hype: I heard all about the orange accents from both my coworkers and fellow attendees on my flight to Cleveland, Ohio, for the event. 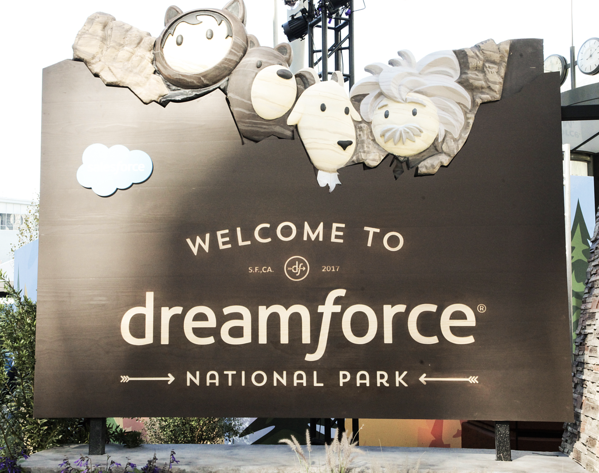 Dreamforce is another excellent example of event branding. The annual conference organized by the CRM software platform, Salesforce. 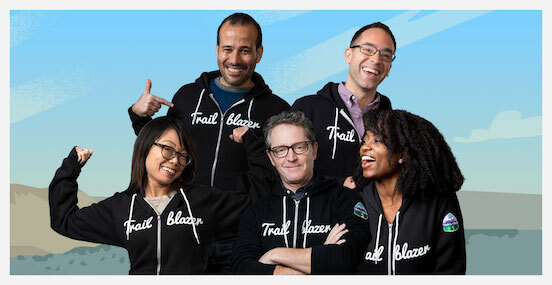 Salesforce brings that adventurous spirit to its online and offline marketing tactics (I am determined to get one of those sweatshirts!) as well as its events. 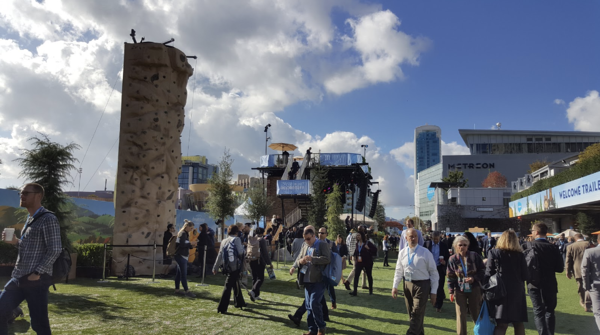 Salesforce brings its adventurous theme into every element of the conference. From an exhibition hall covered in fake trees to a rock climbing wall upon entry, this is far from your average corporate event! Even if you don’t have the budget for a rock wall, you can find unique elements that bring the fun into event marketing. If an employee is allowed to go to one conference a year, you want yours to be the one they pick! Here's some inspiration to start spinning your creative gears. Even if you lack that major budget for a climbing wall or custom-designed orange food, you can make your conference memorable without blowing the bank. 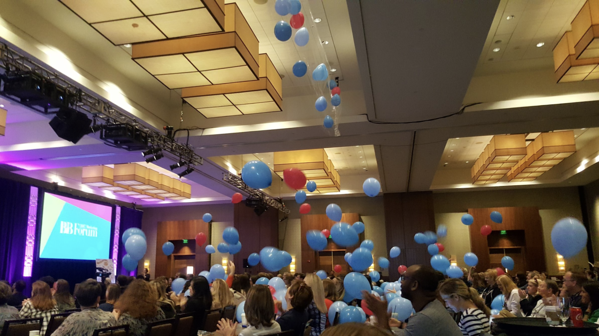 I attended MarketingProfs’ annual conference, B2B Marketing Forum, in 2017 and loved every second of it. Notice that first word there, “quirky”? This is what I love about the conference. Yes, it’s a business conference. Yes, it’s corporate. Yes, people are there to improve the company's bottom line. But, that doesn’t mean it has to be boring! 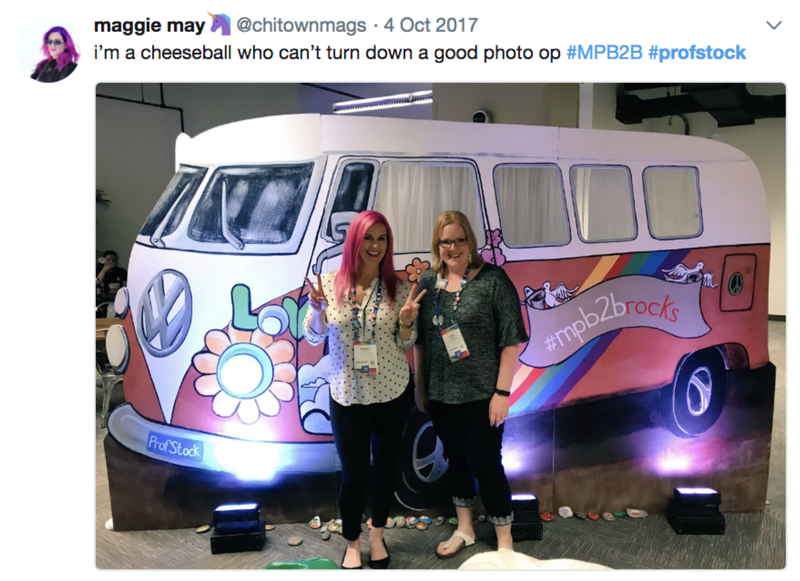 MarketingProfs proves, without a doubt, that “B2B doesn’t equal boring.” By doing so, it enables marketers to do the same thing when executing their marketing strategies. Wondering how exactly MarketingProfs brings out that quirky side? Well, for starters, there’s the conference opening. 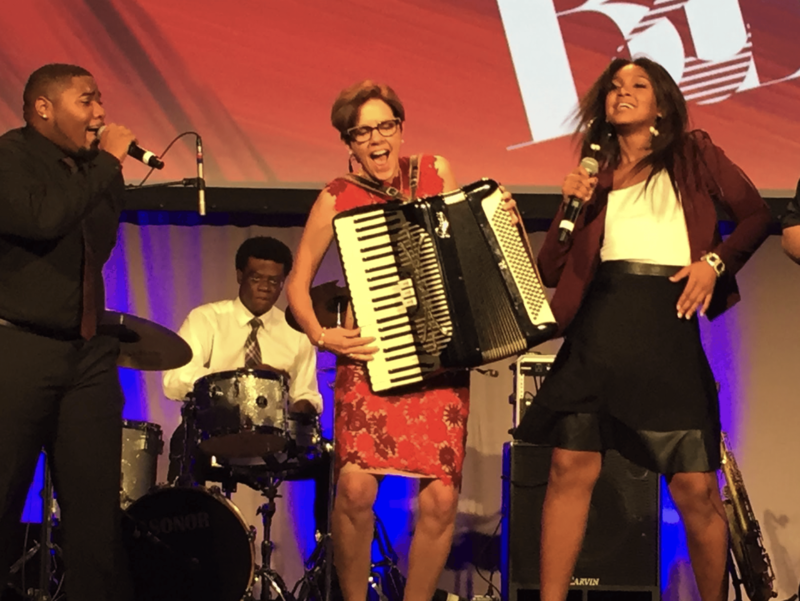 In 2017, the conference opened with Ann, Chief Content Officer and one of the most well-known and loved leaders in the industry, tap dancing. Let me tell you: Every person in that room was grinning from ear-to-ear. In 2016, the conference opened with a choir, and in 2015, Ann opened the conference by playing the accordion. And guess what? Not only do those experiences increase repeat attendance, they also get people talking. Stories about your event increase word-of-mouth awareness through social media and face-to-face interactions. MarketingProfs even managed to step out-of-the-box and into the stall -- the bathroom stall -- with marketing themed signs in the restrooms. 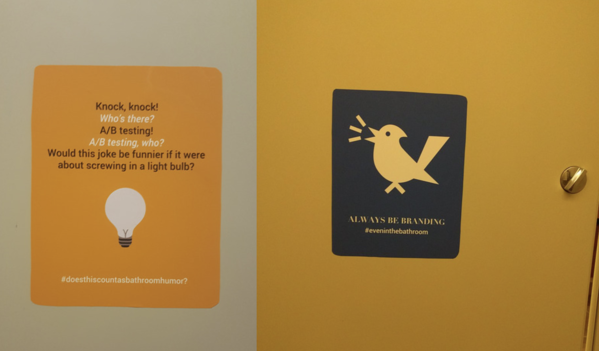 While looking at these “quirky” examples, it’s important to note that the balloons and bathroom signs never took away from the conference content. Rather, they supported it. The same thing applies to Content Marketing World - the speakers at both events provide corporate attendees with actionable insights. TIP: Stuck in your search for speakers? Search the G2 database and find your next keynote speaker who engage, inspire, and happen to be women. That's critical: as we look at these fun event elements, don’t forget the learning, too. Your event must have educational insights to back up the ticket price. Why do managers give approval to attend conferences? I'll give you a hint: It's not to take Instagram photos. The branded elements can't take away from the event's value proposition. Even if you aren’t the event host, you can still add an experiential element. Creating an experience is vital for sponsors. According to Harvard Business Review, customers who have great experiences spend 140 percent more than those who have poor experiences. It literally pays to give your customers a positive interaction. A positive interaction ties back to being memorable. Look for ways to break the status quo, and offer something that will get attendees talking. For example, have you ever thought of having a marching band as part of your event sponsorship? 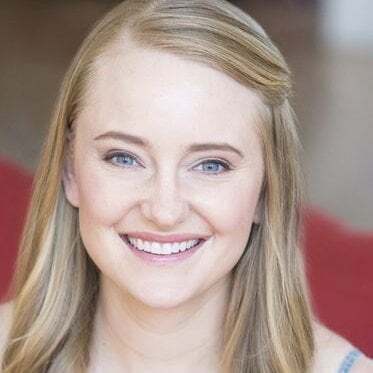 On-demand marketer Katie Martell has! Another of my favorite marketers, Katie knows how to get people talking in the best possible way. She’s been named one of the most interesting people in B2B marketing, a “marketing expert to follow” by CIO Magazine, and a top marketing writer on LinkedIn 3X. So, I did what any former-band-geek-turned-CMO would do. I hired a small local marching band to parade around the first morning of the conference, before the keynote kickoff. My co-founder was proudly leading the charge, carrying a poster saying "make some noise!" with a CTA (call-to-action) to come to the booth. I decked the musicians out in company branded t-shirts and even had a custom drumhead printed for the bass drum. Watch the video: I promise it will be the first marching band you see on an escalator. P.S. : No hard feelings from the event organizers, I'm actually speaking at their event later this year! But, I did make sure to do this at a conference where I was well familiar with the vibe of the event and the attendees; I knew the organizers well enough to beg forgiveness if they'd been upset. I wouldn't recommend doing this at just any conference, especially not one where you may incur fines. My other advice is to tie stunts like this into a larger campaign. A stunt alone does not a successful conference make. We held a number of concurrent initiatives, including a speaking session with a customer and a ridiculously successful bag-insert campaign. What, you ask, is a bag-insert campaign? Many sponsorship packages for conferences come with an option to put something in the attendee bags that are given out at registration. Unfortunately, many brands squander this opportunity by putting product collateral in. Trust me, those are the first things to be dumped in the trash. 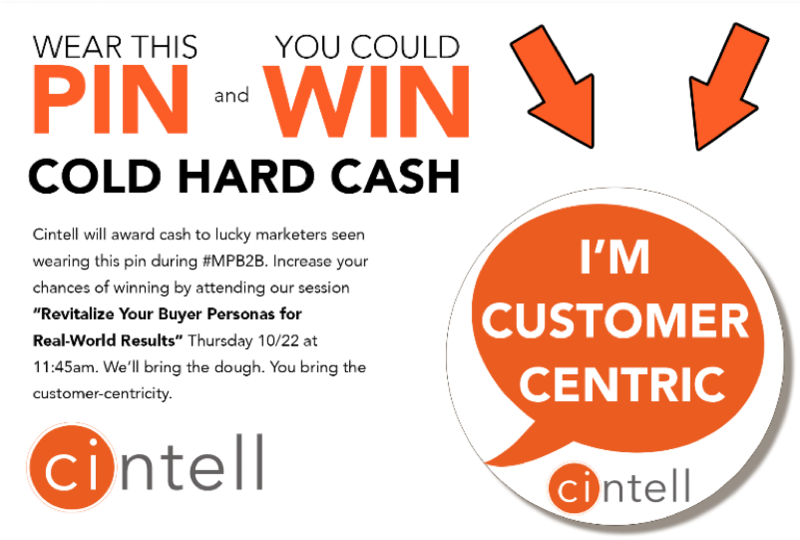 For this event, we printed 4 by 6 cards with a pin attached saying "I'm customer-centric!" – part of our brand messaging. The promise was: If you wear this pin, you could win cash! It also promoted our session time and location. My co-founder and I walked around the conference with $5 bills, handing them out to anyone we saw wearing the pins. (We also scanned their badges to make sure we could add them to our database.) This itself created buzz, as other attendees wondered how on earth to get a free $5. The result? 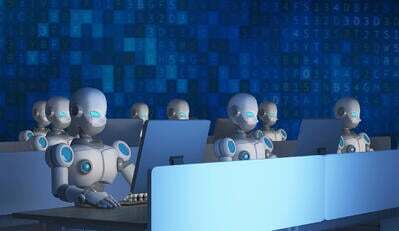 My company went home with a ton of net-new names, brand awareness, and some cheap advertising worn directly on the shirts of most attendees." As Katie mentioned, it’s important to note that the marching band was at the B2B Marketing Forum, which fosters experiences like this. If you are sponsoring an event, the host company will give you rules and guidelines. Some conferences don’t allow promotional activities of any kind beyond that eight-by-eight foot square you signed for in the contract. This is something worth checking out before you sign any contracts and decide where to spend your precious budget dollars. Even within your designated booth area, there are plenty of ways to stand out from the crowd. For example, anyone feel like tossing some spaghetti? TrackMaven, a company that allows marketers to track performance across channels, maximized its sponsor booth giving CMW guests the ability to do just that. 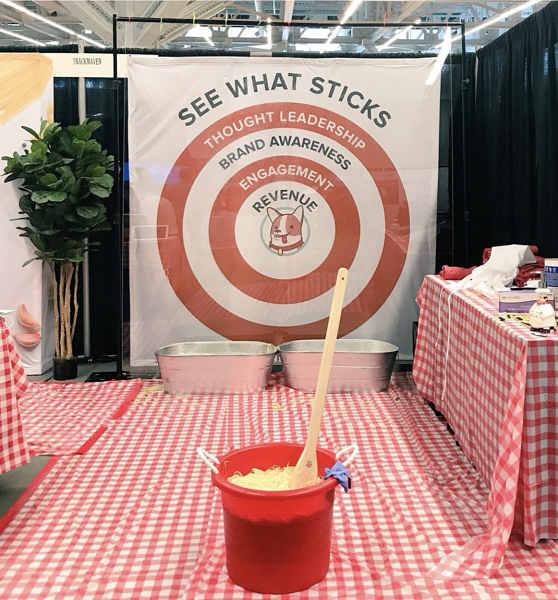 It invited marketers to throw spaghetti and literally “see what sticks,” giving a live (and edible!) analogy of what it means to practice marketing without measuring the results. It’s no big surprise that throwing spaghetti was something attendees shared on social media (just like Katie’s marching band!) increasing TrackMaven’s exposure beyond the convention center’s walls. Take a moment and consider what comes to mind when you hear the phrase “corporate conference.” Now, change one word. Instead of "conference," what do you visualize when you hear "corporate party?" Depending on your industry, those two phrases can have dramatically different connotations! Many conferences include evening parties to conclude a day of learning; they are a valuable opportunity for both the event organizer and sponsors to interact with delegates. Plus, they give attendees an experience that ensures they want to return year after year because they're fun! As we look at these examples, you’ll notice some that are as far from “boring business” as you can imagine. And, believe me when I say the networking connections you make while rocking out your 80’s gear will be built on a strong foundation, creating a relationship that lasts longer than the usual conference handshake. Corporate parties can also provide the opportunity to do a bit of local sightseeing, enabling your guests to see more than a convention center and hotel ballrooms. 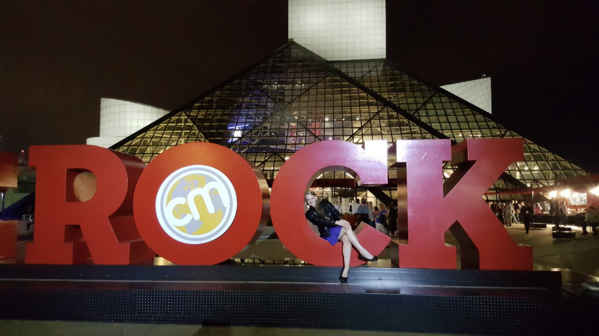 I know I appreciated getting to go to the Rock & Roll Hall of Fame as part of Content Marketing World! I promise I was not the only one who couldn’t resist this photo opportunity, which conveniently includes the CMW logo. Sharing a drink and chatting while surrounded by relics from the world's most famous musicians makes your event attendees feel special. It's not an experience they can get without you there to provide it. Even without tourist landmarks, you can give guests a good time. There is a reason I mentioned the fabulous fashion of the 80’s! 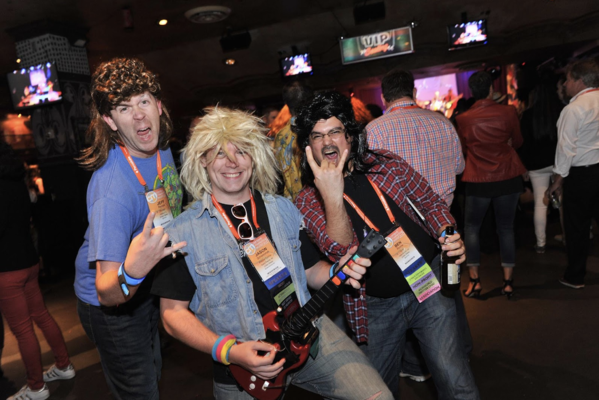 It is a an opening night party theme known and loved by CMWorld attendees. Sourcing event sponsors for these parties is a great way to make them work with your budget and gives sponsors added exposure. In fact, Dreamforce sponsors get so much out of hosting corporate parties that in 2017 there were over 100 Dreamforce corporate parties! Depending on the event size and budget, your corporate themed party may not move offsite. For example, you can see the decor from B2B Marketing Forum’s ProfStock, the dedicated time for drinks, networking and meeting event sponsors. With an understanding of why branding and experiences are essential at events, it’s time to think about how you will implement them in your own event planning checklist. Here are a few theme ideas to get you started. Focus on the decor and elements that create the environment of your chosen era. Whether it’s the music or food (consider inventing a signature drink), you can execute the theme with minimal added costs. Not all delegates will be dedicated enough to pack mullet wigs, but you can still create the environment with those small details, and immerse guests in your theme. Doing so will bring down barriers for networking and increase social media shares. Plus, if your guests don’t dress up on their own, you can give them more subtle opportunities to participate. 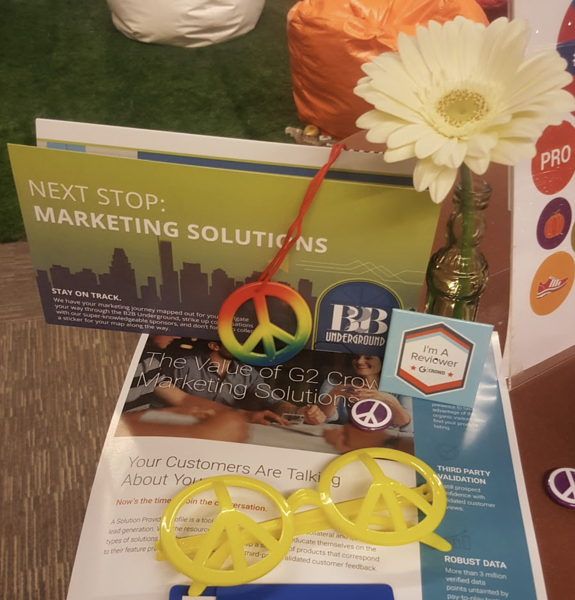 Here are some of the goodies handed out at B2B Marketing Forum’s Profstock. There was a time I lived in Sydney, Australia, and was thrilled I got to take part in executing the Global Marketer’s Conference. Hosted by the World Federation of Advertisers, international delegates attend the event in a different country each year. Given the event took placed Down Under that year, my company's CEO chose to include an Aussie element. The event program and materials were red and yellow, matching the color of Surf Lifesaving Australia’s volunteer lifeguards, who patrol the beach wearing red and yellow. 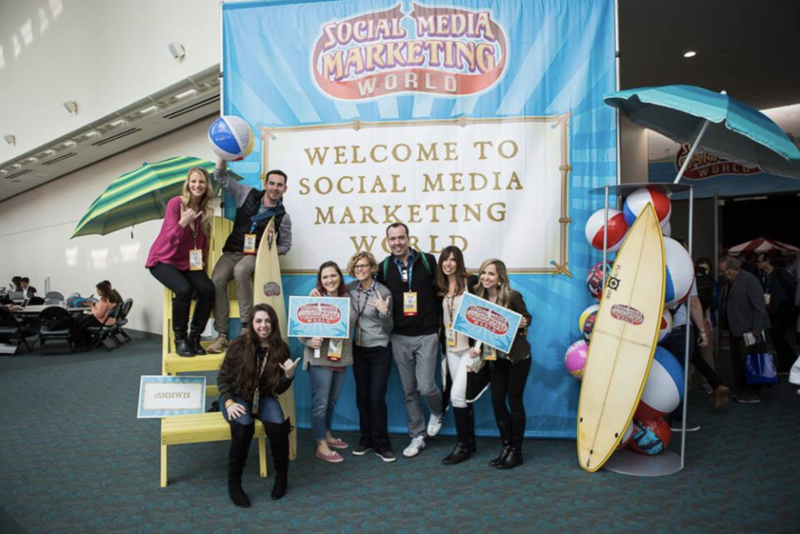 For another event theme that’s all about the beach, keep reading see how Social Media Marketing World maximizes its San Diego location! Take what’s already working and build on it. Dreamforce is a great example of this tactic. The trailblazer theme is already used in all branding, and it ties in perfectly to the attendee experience. Not all companies have such unique campaigns around their brands. But, if you do, why make things harder than they have to be? Look for ways to build on your existing success. Look at your company’s history, culture, and values. Find key words, phrases, or even objects that bring images to your mind. Take those words and have a team brainstorming session building on those ideas. At G2 Crowd, one of our company values is “live at the peak.” I hear “peak,” and I immediately think of a mountain. With that image, I have a potential event theme. Perhaps it is about the customer journey and how businesses can connect with consumers as they travel to the mountain’s peak of making a purchase. Or, I could play off of rock climbing, encouraging attendees to attend to keep climbing higher in their pursuit of marketing success. All event promotions, such as social media shares, have a video game feel. “Game On!” is a theme that provides sponsors with the ability to participate in the concept while including that experiential element. We’ve looked at some engaging examples of conference branding, themes, and experiences. 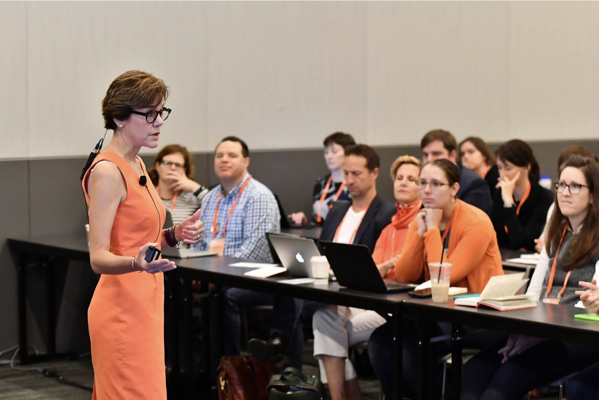 In addition to Content Marketing World, MarketingProfs’ B2B Forum, and Salesforce, there are plenty of other business conferences that show they know how to step outside of the box. 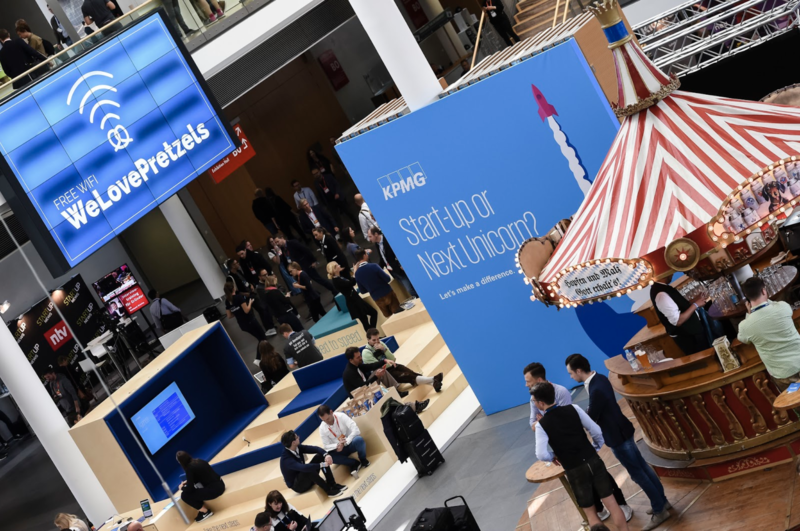 Bitz and Pretzels is a conference for founders, investors, startup enthusiasts, and entrepreneurs in Munich, Germany. And, best of all, it corresponds with Oktoberfest. How can you not love an event named “Bitz and Pretzels” designed around Oktoberfest? While it’s good to have a name that reflects your conference’s content, I can tell you that I looked at hundreds of conferences to find these examples, and no name stood out as much as this one. The theme is unified right down to the wifi password, “WeLovePretzels,” and the mini beer tent pictured below. 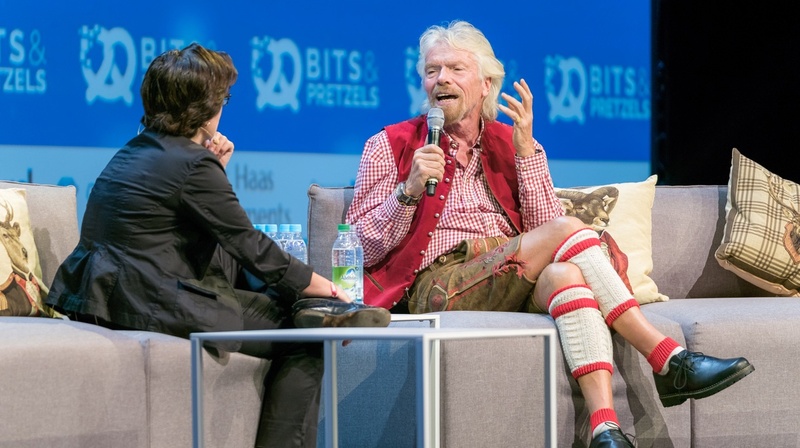 Attendance is by application, and the event is endorsed by Sir Richard Branson himself as: “Professional, fun, and a fascinating array of speakers.” And, he got right into the spirit of it when he spoke in 2016. When you think of San Diego, what do you think of? The beach, of course! 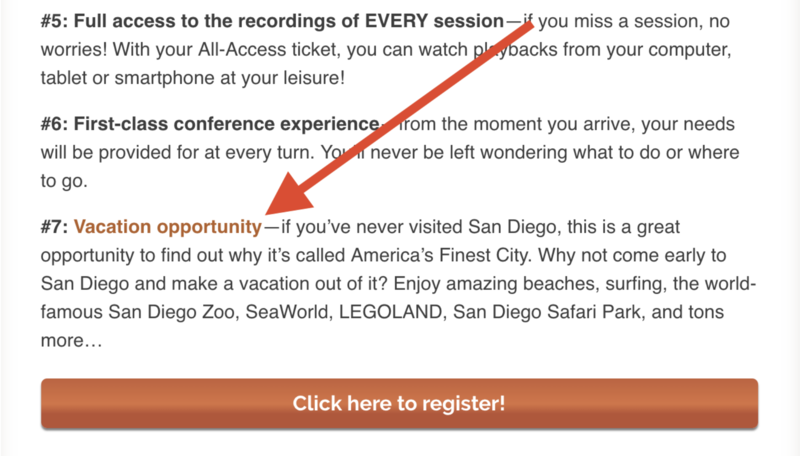 On its event website, the event organizers even use those California credentials in their event promotion as a reason to attend SMMW. The beach theme transferred seamlessly from the decor to the spirit of everyone in attendance. Having its conference associated with the beach (a place people want to be), kept attendees smiling as they channeled their surfer spirit. Now, if you’ll excuse me for a moment, I need a quick writing break to look up flight prices to San Diego! 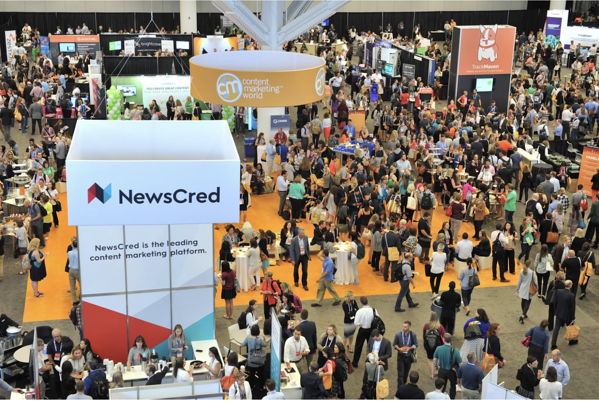 Inbound is an annual event in Boston hosted by Hubspot, an inbound marketing automation software platform. This is another conference designed for marketers, a target market (as you may know) that strives for creativity and the ability to stand out in a crowded market. A conference expo hall is a little bit like a mini trade show where event sponsors can show off their products and services. The lighting sets the mood and lets attendees know this experience holds something special. Not only does Inbound use lighting to create ambiance, it also has a DJ booth in the middle of the expo hall with music designed to make you move. There’s nothing like a good beat to keep attendee energy high! Event branding and creating an experience is where your creativity can shine. This is a great opportunity to work with your team and collaborate. Brainstorm and build on each other’s ideas. (I mean real brainstorming – say every idea with absolutely no judgment!) When you build an event experience together, you’ll all be able to share pride in the results. 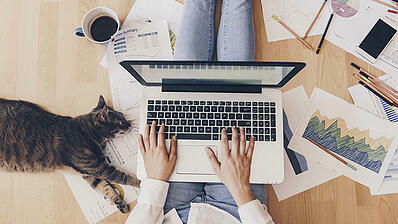 Marketing by nature includes a mix of both analytical and creative thinking. This is where you can have some fun! Best of all, when you are excited about your event, attendees will be, too.